Gus Hall (October 8, 1910 – October 13, 2000) was a leader of the Communist Party USA and its five-time U.S. presidential candidate. Born in Minnesota to a leftist family, Hall joined the American Communist Party at age 17 and became a union organizer in his 20s, helping to found the United Steelworkers of America. He joined the U.S. Navy during World War II and was elected to the executive board of the Communist Party shortly after his discharge. He served eight years in prison after being convicted in 1948 under the Smith Act for supporting the overthrow of the American system of government. Later, as general secretary and perennial presidential candidate of the Communist Party USA, Hall was criticized by fellow leftists for his unwavering support of the Soviet Union. However, he remained a steadfast supporter of Soviet policy throughout his life and never apologized for or wavered from the increasingly marginalized ideology he championed. He was leader of the Communist Party USA from 1959 until his death in 2000. Hall's parents were "card-carrying" members of the Industrial Workers of the World and were founding members of the American Communist Party, later known as the Communist Party USA. Hall was born Arvo Gustav Halberg to Finnish parents in Cherry, a rural community on Northern Minnesota's Iron Range. His parents had been involved in the Industrial Workers of the World and were founding members of the American Communist Party. At 15, Hall left school and went to work in the North Woods lumber camps, where he spent much time studying Marxism. At 17, he joined the Communist Party and became an organizer for the Young Communist League. In 1931, Hall traveled to the Soviet Union spending two years at the Lenin Institute in Moscow. In 1934, Hall went to Ohio's Mahoning Valley. Following the call for organizing in the steel industry, Hall was among a handful hired at a steel mill in Youngstown, Ohio. He was a founding organizer of the Steel Workers Organizing Committee (SWOC) and a leader of the 1937 “Little Steel” strike. Victory in that strike, huge in everything but name, gave birth to the United Steelworkers of America (USWA) in 1943. Philip Murray, USWA founding president, once commented that Hall's leadership of the strike in Warren and Youngstown was a model of effective grassroots organizing. It was also in Youngstown that Hall met Elizabeth Turner. They were married in 1935. Elizabeth Hall was a leader in her own right, among the first women steelworkers and a secretary of SWOC. They went on to have two children, Arvo and Barbara (Conway). Hall and other rank-and-file steelworkers signed up workers who wanted to join a union. “This had to be a secret operation,” Hall wrote in a 1972 letter to the USWA. “Any man who signed was immediately fired if it became known. As a matter of fact, I was fired. It was not until we had collected thousands of such signed cards that Lewis agreed to set up the [SWOC]. I was on the committee that presented the cards to John L. Lewis in the dugout of a baseball stadium where he was the speaker at a Miners' Day rally” in Johnstown, Pennsylvania. Thus, Lewis was convinced, and one of his first decisions was to hire Hall as a full-time SWOC organizer in the Mahoning Valley where he served as an international representative throughout the organizing drive and later as chairman of the strike committee during the strike. Under Hall's leadership, 10,000 workers were recruited to the steel union in the Mahoning Valley. Later, he resigned his union post to become an organizer for the Communist Party in Youngstown. Hall volunteered for the U.S. Navy when World War II broke out, serving as a machinist in Guam. He was honorably discharged March 6, 1946. After his return, he was elected to the National Executive board of the American Communist Party. In July 22, 1948, a federal grand jury indicted Hall and 11 other party leaders under the Alien Registration Act, popularly called the Smith Act, for conspiring to teach and advocate the overthrow of the government by force. The dramatic 10-month trial, marked by loud confrontations between the defendants, their lawyers and the judge, Harold R. Medina, was held in the United States courthouse on Foley Square in downtown Manhattan and shared headlines with another celebrated trial under way in the same building—the perjury trial of Alger Hiss, a former State Department official accused of having spied for the Soviets. Wives and supporters of Hall and other jailed Communist leaders protest outside courthouse in 1949. Hall, center, with fellow convicted party organizers John Gates and Carl Winer. In October 1949, Hall and 10 others were found guilty of conspiracy to teach the overthrow of the U.S. government and sentenced to five years in prison. While the verdict was being appealed, Hall was elected to the party's second-highest position, national secretary, but after the Supreme Court upheld the convictions in 1951 he and three others jumped bail and crossed the border into Mexico, only to be captured three months later by Mexican Secret Service agents. Hall, his sentence lengthened to eight years, was confined to the Leavenworth Federal Penitentiary in Leavenworth, Kansas. A series of United States Supreme Court decisions in 1957 threw out numerous convictions under the Smith Act as unconstitutional. The statute remains on the books, however. After his release, Hall continued his activities. In 1959, he was elected CPUSA general secretary. But the Cold War era and McCarthyism had taken a heavy toll on the Communist Party. Hall, along with other Party leaders who remained, sought to rebuild it. He led the struggle to reclaim the legality of the Communist Party and addressed tens of thousands in Oregon, Washington and California. Hall became a speaker on campuses and talk shows as an advocate for socialism in the United States. Hall argued that socialism in the United States would be built on the traditions of U.S.-style democracy rooted in the United States Bill of Rights. He would often say Americans did not accept the constitution without a Bill of Rights and they won't accept socialism without a Bill of Rights. Despite being widely seen, even by fellow socialists, as an apologist for Moscow-style totalitarianism, he professed what he called a deep confidence in the democratic traditions of the American people. 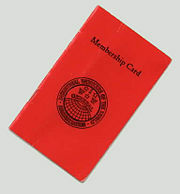 Throughout the 1960s and 1970s Hall worked to build the Communist Party among the young “baby boomer” generation of activists involved in the peace, civil rights and the new rank-and-file trade union movements. He envisioned what he called a "broad people's political movement." The phrasing was not very different from that used by radical campus groups like Students for a Democratic Society. In fact, there were many points of convergence between the Old Left, as it came to be called, and the New Left. Both called for an immediate end to the Vietnam War, sympathized with Fidel Castro's rule in Cuba, denounced American foreign policy in Latin America, and opposed the nuclear arms race. The Party also allied itself with the civil rights movement and in 1966 issued a statement of solidarity with two militant organizations, the Student Nonviolent Coordinating Committee and the Black Panthers. However, Hall never was able to forge a durable alliance with the New Left. While younger radicals like Tom Hayden styled themselves "grass roots" revolutionaries, sought to distance themselves from Stalinism, and patterned themselves on Che Guevara and other third world icons, Hall stayed faithful to the Soviet Union and to its ideal of an ascendant working class firmly rooted in the dislocations of the early twentieth century. The Party under his leadership faced a serious crisis of credibility among fellow leftists when it refused to condemn the Soviet invasion of Czechoslovakia in 1968. Hall ran for president four times—1972, 1976, 1980, and 1984—the last two times with Angela Davis. The party began to face increasing struggles with the expenses of mounting a national campaign, as well as the difficulty in meeting the strenuous and different election-law provisions in each state and getting media coverage. After 1984, the CPUSA suspended running national electoral campaigns, while continuing to run candidates at the local level. In the late 1980s, when liberalization and democratization were under way in the Soviet Union and Eastern Europe, Hall stood by his "anti-revisionist" Marxist-Leninist stance. Concerning Stalin, he admitted that even leaders of a socialist country might err sometimes, but suggested that the Soviet historians were exaggerating Stalin’s crimes. Hall declared that he had not become a member of CP because of Stalin and would not leave because of him. According to formerly secret documents quoted by the Washington Post in early 1992, Hall received over $2 million from the Soviet government for the party's expenses in publishing the Daily Worker and for rental fees for the party headquarters. After the dissolution of the Soviet Union in 1991, the party faced a crisis. Hall led a faction of the party that stood against Gorbachev and for the Communist Party of the Soviet Union. By this time, fewer than 10,000 party members remained and Hall's Stalinesque grip on the party came under fire from within the ranks, with many members calling for more openness and democratization. In 1991, Hall conducted a news conference at the party's Manhattan office, warning of a new wave of witch hunts and McCarthyism, but this time in the Soviet Union, which he had visited only a few months earlier. Asked if he had plans to visit again in the near future, he said no. Instead, he pointed to the world's last bastion of Stalinism: "The world should see what North Korea has done," Hall said. "In some ways it's a miracle. If you want to take a nice vacation, take it in North Korea." Hall continued to lead the Party until the end of his life. He died on October 13, 2000, and was replaced as General Secretary by his lieutenant, Sam Webb. Ecology: Can We Survive Under Capitalism?. International Publishers, 1972. The power of ideology. New Outlook Publishers, 1989. Riley, Michael. Last of The Red-Hot Believers. Time Magazine. September 9, 1991. Tanenhaus, Sam. Gus Hall, Unreconstructed American Communist of 7 Decades, Dies at 90. New York Times, October 17, 2000. This page was last modified on 2 April 2008, at 08:19.